The economic survey that was released by the finance ministry ahead of the final budget of the current government, heading towards the next general elections, has been heralded as a remarkable accomplishment. The country’s finance minister seemed jubilant when he quoted the fiscal year’s growth rate at 5.3%. The government has cited the growth rate as the highest achieved in at least last nine years. If one is to closely follow the indicators mentioned in the economic survey, it becomes evident that the numbers and performance indicators remain similar as those which were presented during the last year. However, the promises made by the government last year have been presented with the mere twist of facts, figures and by quoting performance in inflated terms. Let’s decipher some of the indicators. The government has claimed that the overall inflation rate was contained to 4.09%. However, the ministry has not clarified the source and basis of this suggestion: what factors were taken into account while arriving at this number? How can the government with the population figures that are based on a 20 years old census can accurately claim any statistics regarding the fall or increase in the country’s inflations rate? If one is to assume that inflation rate has not increased further, as the government claims, that means inflation continues to remain as high as it was during the previous year. The finance minister, Ishaq Dar, has maintained that Pakistan’s economy has surpassed $300 billion. 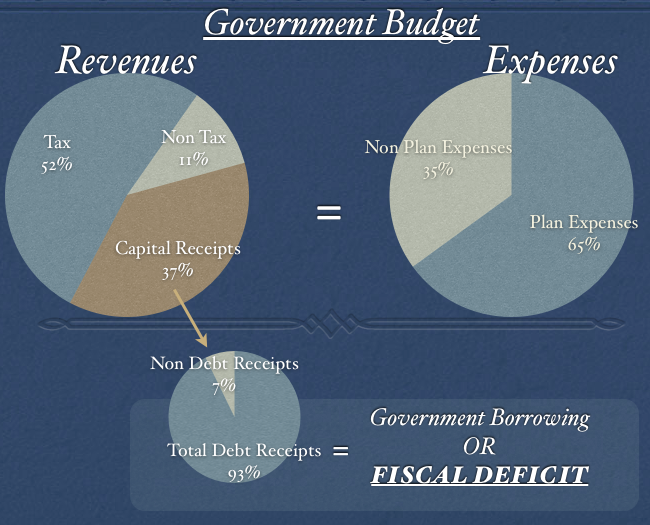 Dar has failed from explaining that what percentage of this economy is based on borrowed money and loan? Moreover, if the government’s optimism is to be taken as an indicator of growth than the ruling party needs to clarify that how many investments in this regard, and growth was generated by the private investors, small and big, which are hardly a result of the government’s efforts. A large sum of this number, that the government claims were added during the last fiscal year, has come due to the foreign investments whose nature remains beyond scrutiny, for the government has clearly shown reluctance toward making public any of its dealings, primarily with China, that happens to the newest addition to Pakistan’s loan ridden economy. One of the most interesting aspects of the economic survey was the government’s claim that the fiscal deficit of Pakistan has registered a decrease, from 4.8 to 4.2 percent. While the federal minister quoted cherry picked facts to support his government’s claims of having secured a decrease in the country’s fiscal deficit, the economic realities on the ground point an alternative story: Pakistan today is more burdened with foreign loans and borrowed money than any time in Pakistan’s past history. For instance, the released economic survey doesn’t comprehensively mentions whether the investments and loans coming from China are part of the calculations upon which the government has based its claims of having decreased Pakistan’s fiscal deficit? Second, apparently, the government at the moment is not considering Chinese loans as part of its fiscal deficit scheme which as the recently released report by Dawn claimed, would be returned back in the form of giving China the control of significant chunks of Pakistan’s domestic economy and industry through the China Pakistan Economic Corridor (CPEC) projects. However, Dar, on the other hand continues to harp that Pakistan doesn’t need any loans from the IMF, for the country’s economy is rapidly gaining independence. Dar’s claims pose the picture of a bagger’s dilemma where one has to choose between an expansive but pragmatic (IMF) and charming but unviable (China) donor. Moreover, according to the economic survey and the newly presented budget, Pakistan’s tax collections have increased more than 70 percent in comparison to the previous year. However, the minister of finance has not elaborated that what percentage of these collections were made from the country’s elite class that controls more than half of Pakistan’s economy and continues to defy any regulations that bind them with fair and appropriate tax payments. It’s unfortunate that the government continues to manipulate facts to showcase a rosy picture of Pakistan’s economy and growth rate which is far-fetched and unrealistic. Will we be the 16th largest economy in 2050? A REPORT by PwC has everyone talking due to a claim reportedly made in it that Pakistan will be the world`s 16th largest economy by the year 2050. The finance minister has gone the extra mile by publicly congratulating the country on the `economic turnaround` affected by his government, citing the PwC report and an opinion piece in Bloomberg by George Mason University`s Professor Tyler Cowen, in which he says that `most of Pakistan`s developments are fairly positive`. Unfortunately, the finance minister, in his enthusiasm, claimed that Bloomberg has also declared Pakistan as the most underrated economy in the world in its recent report titled Pakistan`s Economy Is a Pleasant Surprise. In f act, the piece in question is not a `report` but an opinion column, and below it, the following disclaimer is clearly featured: `This column does not necessarily reflect the opinion of the editorial board or Bloomberg LP and its owners. In any case, let`s take the example of the PwC report since it is weightier and the claim being made sounds far more spectacular. The first thing to note is this: the PwC report does not say anywhere that Pakistan is going to be the 16th largest economy in the world by 2050. What it says is that Pakistan has the potential to be the 16th largest economy in the world by 2050. There is an important difference between both claims, and it should be borne in mind before popping any corks. So the first obvious question to ask is this: what needs to be done in order to unlock this potential? The PwC report does not dwell on Pakistan in any detail. It features extended analyses on Poland, India, China, and Brazil, as well as boxed analyses on Turkey, Nigeria, and Columbia. It pinpoints Vietnam, India and Bangladesh `to be three of the world`s fastest-growing economies` till 2050, and says `Mexico could be larger than the UK and Germany by 2050`. Pakistan only features on a couple of lists presented in the report, showing it as having the potential to become a large economy by 2050 in purchasing power parity terms. `To realize this growth potential,` the report says at the outset, `emerging market governments need to implement structural reforms to improve macroeconomic stability, diversify their economies away from undue reliance on natural resources (where this is currently the case), and develop effective political and legal institutions`. Next question to ask is: how do they make their projections? What methodology do they use? The report projects future GDP growth rates based on four variables demographics, or the growth of a working-age population; growth in quality of the workforce, measured through average education levels in the workforce; growth in physical capital stock, measured as new investment minus depreciation of existing stock; and technological progress. As any of these indicators improve, the projection for that country`s future GDP growth rate goes up. On top of that, they make an assumption about real market exchange rates relative to purchasing power parity rates. So if a country is a food importer, and its exchange rate depreciates significantly over time, that would make its food more expensive, thereby lowering its GDP in purchasing power parity terms. A significant share of the boost that Pakistan gets in this projection comes from the large growth of its working-age population till 2050, compared to the ageing populations of the advanced industrial West or the advanced countries of the Far East (Japan and Korea for example and China`s workforce will be weighed down in the decades to come due to its one-child policy). Second, Pakistan is food self-sufficient, which means food prices are relatively immune from international shocks, and below what they are in many other countries at the same level of development. This gives a boost to our GDP in purchasing power parity terms. And that`s pretty much all folks. This methodology says we should grow rather spectacularly in the decades to come because the sheer number of able-bodied people available to work will increase and we can grow enough food to feed them all while keeping food prices under check. In fact, as per the data in the report, Pakistan has the second largest growth in the number of average working age population till 2050,afterEgypt. The long story here is that the projections made in the report come with a heavy caveat. In order to unlock this potential, we will need further reforms in our political and institutional systems of rule, as well as diversification of our manufacturing base, increase productivity, and fix our balance of payments to underpin macroeconomic stability. The short story is that, in our case, the methodology used to make the projections has given us a boost largely on the basis of a growing population. If we can continue investing in our capital stock at present levels, and educate and feed each of these working-age members of the population at cheap rates, then our economy will have this potential. The report is not meant to spark national celebrations. It is not even meant as a guide for policymakers. It is mainly aimed at large corporations and is trying to tell their leadership that, over the long run, the trade winds are blowing eastward. Therefore, in order to position their enterprises to capture the dividends that this large, irreversible shift of economic dynamism towards the east is going to bring, they need to start entering markets like China and India n and solidify their presence in these economies. And in doing so, it uses a very broad brushstroke methodology to highlight the underlying sources of strength in the new centers of dynamism. Editor’s Note: Even today, Pakistan’s underground tax evaders run economy is bigger than the prevailing economy. ISLAMABAD: Pakistan’s external debt is projected to grow to a whopping $110 billion within four years and it will need over $22 billion a year just to meet external payment requirements, posing a serious threat to the country’s solvency. By that time, Pakistan will again be back to the International Monetary Fund (IMF) to avoid default on international payments as it did in 2013, according to independent projections revealed at the National Debt Conference on Saturday. Two renowned economists, former finance minister Dr Hafiz Pasha and former director general debt Dr Ashfaque Hasan Khan, have made the external debt projections. 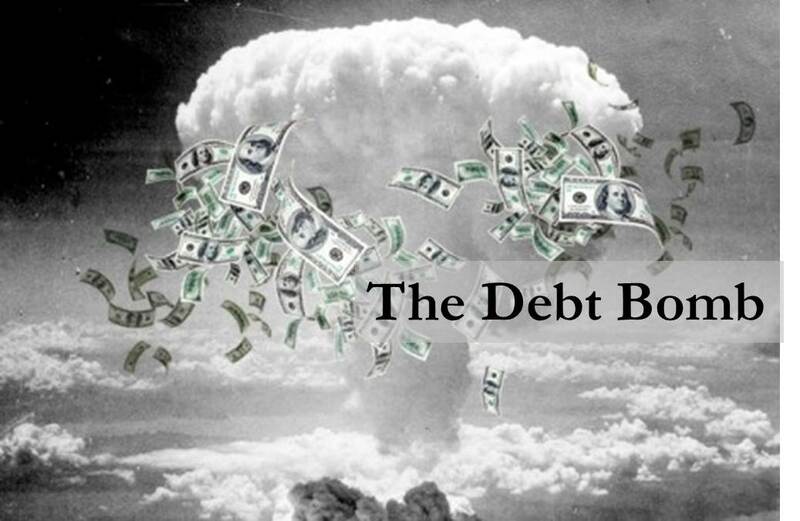 The $110-billion external debt level by 2019-20 will be $24 billion higher than projections made by the IMF in its latest report on Pakistan. Khan shared his assessment at the debt conference, arranged by the Policy Research Institute of Market Economy (PRIME) – an independent think tank. 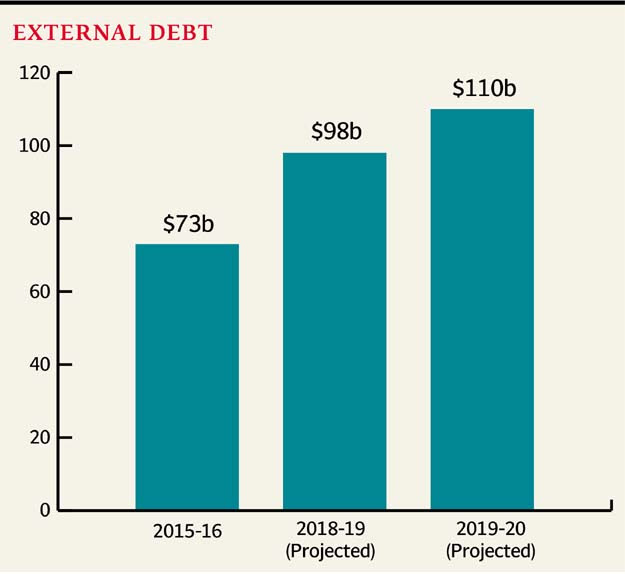 The duo updated their previous external debt forecast for fiscal year 2018-19 from $90 billion to $98 billion after the government borrowed heavily in the past one year. At present, the external debt stands at $73 billion, which has been projected to swell 50% to $110 billion in just four years. They did not see a major change in Pakistan’s export situation and anticipated that by 2019-20, the exports would stand roughly at $25 billion, a level that the country crossed in the last year of previous government of Pakistan Peoples Party (PPP). Owing to slowdown in exports, Pakistan’s external debt to export ratio has been projected at 441.8% by 2019-20, which is highly unsustainable. 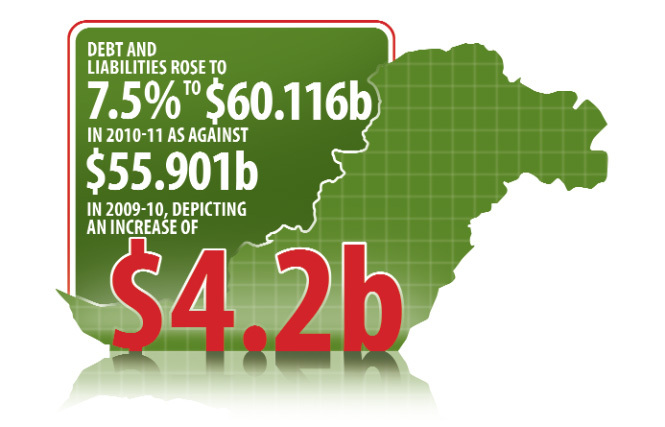 By that year, the country will consume 40% of its export earnings to service the external debt. “Pakistan is fast slipping into the debt trap and neither the government nor parliament is playing its due role,” remarked Asad Umar, MNA of Pakistan Tehreek-e-Insaf while speaking at the conference. Khan said by 2019-20 amortisation payments would increase to $10 billion. To fill the current account gap, the country will require another $12.5 billion a year, increasing the total external payment requirement to $22.5 billion. The current account deficit will mainly widen due to imports of machinery and plants for projects being developed under the China-Pakistan Economic Corridor (CPEC). Against IMF’s projection of $16.7 billion, Khan said total external financing needs to bridge the current account deficit and repay loans would stand at $22.5 billion by 2019-20. After exhausting all available resources including CPEC financing, foreign investment and funds from traditional donors, there would still be $11-billion financing gap, which the country would not be able to bridge without IMF’s help, said Khan. He predicted that Pakistan would return to the IMF in 2018-19 – the fiscal year when the country’s external debt would be $98 billion and its financing gap will be $9 billion. “Pakistan’s debt situation is deteriorating rapidly and posing a serious threat to its solvency,” he cautioned. Commercial borrowings comprised 25% of external debt, which was a matter of concern, said Shahid Kardar, former governor of the State Bank of Pakistan. He said low returns on the country’s foreign currency reserves compared to the borrowing cost were also a matter of concern. Khan said the PML-N and PPP governments had added $49 billion to the current external debt of $73 billion. Most of this amount, estimated at $32.6 billion, was added from 2008 to 2016 while the remaining $17.4 billion was added during the 1990s. “We need to develop a more effective borrowing strategy, which should be consistent with the country’s development priorities,” suggested Khan. “Pakistan can keep its debt at sustainable levels by achieving about 6% annual economic growth,” said Dr Ali Kemal, research economist at the Pakistan Institute of Development Economics (PIDE). He, however, said despite the increase in debt levels, Pakistan was still not Greece. “We are at a comfortable stage and there is no need to worry about anything,” said Zafar Masud, Director General of the Central Directorate of National Savings, while speaking at the conference. Published in The Express Tribune, November 13th, 2016.